DogTime salutes Marthina McClay (interviewed here) and Our Pack of San Jose, California. I was already a trainer part time, later full time, and had been working with animals most of my life on some level. Then I began working with my local shelter and other groups fostering. The fostering didn’t last, I began thinking about starting my own rescue and did so in 2006. In 2007, we got our 501c3. 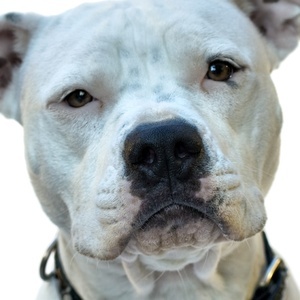 To promote compassion and kindness toward Pit Bulls by creating breed ambassadors through both in-shelter and foster-home training of dogs and their people. We will facilitate responsible guardianship through education and assist, as needed, in the life-long bond between a Pit Bull and its person. 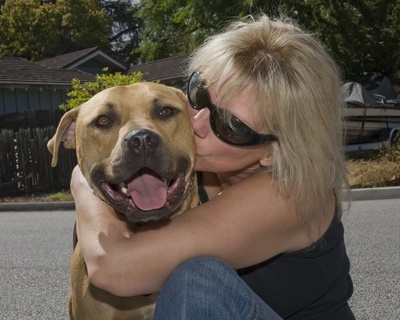 Our Pack will also educate the public about Pit Bulls as wonderful pets. Through shelters, abuse cases, and dog fighting busts. Depending on their needs, they come to us to get some training or Canine Good Citizen prep. If they are from an abuse case, we often will just let them decompress a bit and get adjusted. Many times we also like to prep them for therapy work. Pit Bulls love being with people and being touched. This is very easy for them to do. For instance our Vick dog was a registered therapy dog in 5 weeks after coming to Our Pack. See below. Leo is one of the fifty Vick dogs confiscated from the football player’s property late last year – although to meet him now you’d never guess at his unfortunate beginnings. In fact, it seems wherever Leo goes he garners adoring smiles and effusive compliments. What a sweet boy! Where did you get him? He’s so well-behaved! To which he responds with tail wags and dreamy gazes from his kohl-rimmed eyes. His most adoring fans are schoolchildren. It’s amazing to watch, surprising to some, and yet to those who know the Pit Bull breed, not a surprise at all. Leo is the consummate example of true Pit Bull spirit – despite the life he led before with his former owner, he has made a quick ascension to stardom: acing his obedience classes, playing and socializing with other dogs, and revealing himself to be a true ambassador for all canines, not just Pit Bulls. He has already begun work as a Therapy Dog with Therapy Dogs, Inc. and is invited weekly to a local South Bay hospital to bring comfort and smiles to the patients there. His biggest supporters aren’t just the patients either – staff, nurses, and EMTs have taken to calling him “Dr. Leo” for his healing touch. All in less than two months. He’s such a tenderheart. When he came to me, I was prepared for anything. But I never realized I would be meeting the Casanova of Dogs. He has this way of romancing you with those brown eyes of his – he’s truly amazing. Of course, if you spoke with Leo today, he would likely gloss over his accomplishments and the association that has made him famous. Instead, he would politely take a seat beside you, plop his head in your lap, gaze up at you with those dreamy eyes and talk about how he enjoys Sunday afternoons playing with his doggie brothers and sister, and how much he looks forward to visiting more people next week. This is the true Amercian Pit Bull Terrier: resilient, people-loving, willing to please, and just so good-hearted!